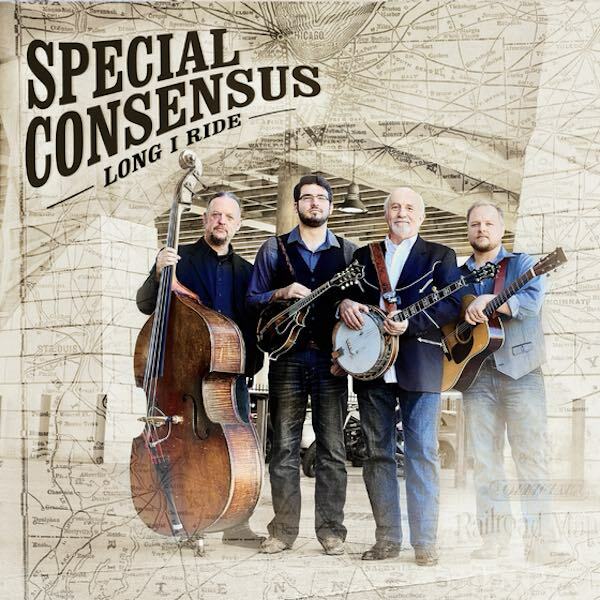 Special Consensus celebrates its 40th anniversary as a band with an engaging set of songs and guest collaborations in an album called Long I Ride. The title track, written by former band member Robbie Fulks, showcases each of the three vocalists in the group including newcomer/mandolinist Nick Dumas. Bluegrass favourites Della Mae join the band for a fresh take on the Larry Cordle classic “Highway 40 Blues” and label mates Rob Ickes and Trey Hensley, together with producer/banjoist Alison Brown, deliver a blistering version of the Josh Graves penned standard “Fireball.” Other stand outs include a bluegrass version of Stoney LaRue’s “First One to Know” featuring a guest vocal appearance from Mountain Faith’s Summer McMahan and a western swing tinged Joe Newberry original “Baby I’m Blue” featuring the twin fiddles of Buddy Spicher and Matt Combs. Long I Ride follows on the heels of Special Consensus’ guest laden, multi-award winning album Country Boy: A Bluegrass Tribute to John Denver. 5/28-29 – Kendallville, IN – Tri-State Bluegrass Fest. 6/05 – Niles, MI – Bluegrass / Americana Music Fest. 7/22-23 – Stevenson, WA – Columbia Bluegrass Fest. 7/24 – Snohomish, WA @ Tim Noah Thumbnail Theater 8/13 – Reno, NV – Bowers Mansion Bluegrass Fest. 9/18 – Flagstaff, AZ – Pickin’ In The Pines Bluegrass Fest. 9/30-10/1 – Ochlocknee, GA – Great Southern Music Fest. 10/6-8 – Hattaras Village, NC – Hattarasity Bluegrass Fest.